In 1920 the Marconi Company started experimental broadcasts of speech and music from Writtle near Chelmsford in Essex using the callsign MZX. These broadcasts were joined by those from station MPD at Poldhu in Cornwall. The government quickly became concerned that it had no control over what was potentially a very powerful medium so it insisted that each transmission had to be separately authorised. The broadcasts from MZX took place mostly daily and became popular. Some were even sponsored. The most notable was a performance by Dame Nellie Melba which was sponsored by the Daily Mail. This broadcast received huge advance publicity, and was heard over much of western Europe with reports from Iran & Canada. In Chelmsford police had to be drafted in to control the crowds. MZX broadcast on 2750m Long Wave with a power of up to 17KW. Naturally the government could not allow people to be entertained by the wireless, and shortly afterwards announced that no further broadcasts would be authorised. They alleged that the station in Essex had caused interference to military radio transmissions. The British radio listener had no other choice but to tune to stations from overseas. The Dutch station PCGG had been broadcasting some of it's output in English since 1919. Soon there was heavy pressure from not only the listeners, but many commercial organisations keen to start broadcasting. They were encouraged by the proliferation radio stations in North America, but the authorities had different ideas. Eventually under intense pressure the British government was forced to give in, and grant some licences. 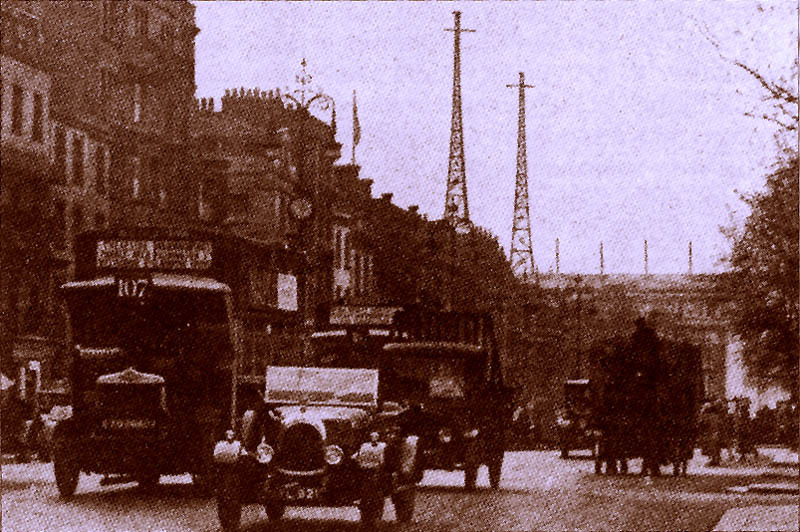 On February 14th 1922 the first official public station opened: 2MT in Chelmsford operated by the Marconi company. 2MT was only allowed to broadcast for 30 minutes on Tuesday evenings with a power of 200W on 700m. The first daily station was 2LO in central London, also operated by the Marconi company. It opened on May 11th 1922 operating for one hour a day using a power of 100W on 350m. On May 16th 2ZY in Manchester made it's first test broadcast on 375m, operated by the Metropolitan Vickers company. The General Electric Company was planning a station for Birmingham. The Post office had astonishing control over the content of the broadcasts. Initially no music was allowed, and broadcasts were limited to just seven minutes at a time. This allowed the authorities to monitor the output, and demand corrections if it disliked what had been broadcast. After 7 minutes the station would go off the air and listen on their frequency. The Post Office could then use their own transmitter on the same frequency to transmit corrections, or even demand the closure of the offending station. It is not thought that this ever happened. The stations were desperate to overcome these limitations, and on May 18th 1922 began talks with the Post Office. At this time Marconi, Metropolitan Vickers, General Electric, Western Electric, The Radio Communication Company and British Thomson-Houston had all applied for licences. The agreement was that all these companies would together set up the British Broadcasting Company, which could then open up stations in other parts of the country. A tax was to be added to the cost of radio receivers to fund the BBC, but as most receivers at this time were home made 'crystal sets', a licence was also introduced for operating a wireless receiver. The money generated was to be shared between the BBC and radio patent holders. The licence fee for listening was 10 shillings a year. At that time, you could rent a 3 bedroom house in London for 10 shillings a week! On November 14th 2LO became part of the BBC. The next day was election day, and the BBC hastily opened 5IT in Birmingham to broadcast the results. On the same day 2ZY became part of the BBC, and at last started broadcasting daily. The Post Office was still not happy with an independent company broadcasting to the population, so as the British Broadcasting Company's initial 5 year licence was about to expire, the government set up the Crawford Committee to come up with a solution. It recommended that the BBC should be replaced with a public authority. Thus the British Broadcasting Corporation was born on January 1st 1927. Although the charter for the new BBC allowed it to be separate from direct government control, it was controlled by a board of governors who were appointed by the government. The Sykes committee was set up to consider funding the BBC through advertisements, however there were concerns that the lack of air-time available for commercials would penalise smaller advertisers who could not afford the premium rates. The lack of advertising on the BBC would give many groups the opportunity to tap this lucrative market in future decades. No independent licences were granted for another 37 years, and even then you had to live on the Isle of Man to hear it. The rest of the UK had to wait over 46 years.